The best aurora I have observed in a decade suddenly appeared in the evening sky on Feb 27th 2014 when a CME associated with an X4.9-class solar flare hit Earth's magnetic field generating a severe G2 geomagnetic storm which lasted for several hours producing the most vivid red, orange, and green colours I have observed since the extreme solar storms of 2000-2003. The rays were over 80 degrees high and almost touching the zenith with crimson colours so intense that the frost on the grass was glowing red!. 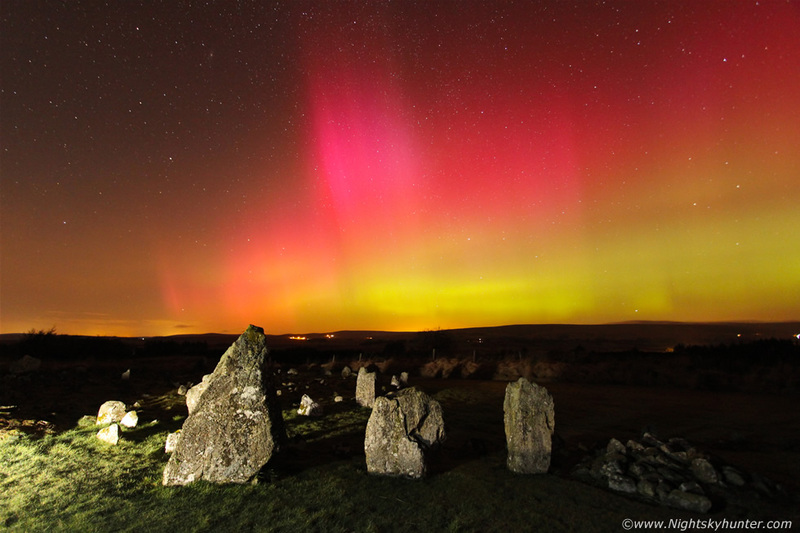 Image taken with a 10mm ultra wide angle lens from the ancient Megalithic site at Beaghmore stone circles in Co. Tyrone, read the report for more information. * All images are available for sale in the form of photo prints, canvas or digital files for licensing, if you are interested in a purchase simply drop me an email.